I’d heard that there was a Tearle memorial in Cosgrove Church and it took me two trips there even to find it. However, the adventure was worth the trouble because this is a fascinating story. 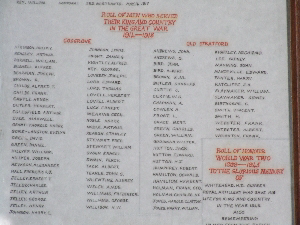 You can see below the memorial to “Those who served” in WW1 and amongst the names was John G Tearle. His parents were Charles 1859 of Stanbridge and Lizzie nee Gates. They called him John Gates Tearle. He had the service number 1469 and he fought with the Oxfordshire and Buckinghamshire Light Infantry. Now, Lizzie Gates was the daughter of Ephraim Gates and Sarah nee Tearle 1837 Stbg, and Sarah’s parents were Abel 1810 Stbg and Martha nee Emmerton. This means she is on the branch Joseph 1737 via William 1769 and Sarah nee Clark. 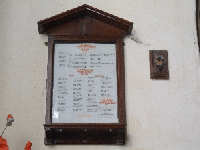 You can see the marriages of both Abel and Sarah in the Stanbridge banns register. Thus Lizzie is on the branch Joseph 1737. Charles’ parents were William 1832 Stbg and Catharine nee Fountain. William was the brother of my gg-grandfather James 1827 Stbg so Charles was a cousin of my g-grandfather Levi, the blacksmith of Wing. This puts him on the branch John 1741. You can see John just 10 months old, in the Wolverton census of 1891. 1891 = Charles 1860 Stbg Lizzie 32 Rose L 7 John G 10m in Wolverton. Charles is a railway worker, like his father, and is living amongst a group of railway employees, possibly employee accommodation. And then we see them one last time in the Wolverton census of 1900. 1901 = Charles 1860 Stbg Lizzie 42 John 10 Nellie 6 in Wolverton. Charles is a railway platelayer and is living at 524 Glyn Sq, Wolverton. So I’m now fairly sure this was tightly-packed worker accommodation. John married Violet Elmore in 1913 and they had a son in 1914 who they called Richard Elmore Tearle. This is where John’s story becomes very sad. Richard was working in Coventry during the Blitz of 1940 and he was tragically killed in a bombing raid. You can see his story on the WW2 page. 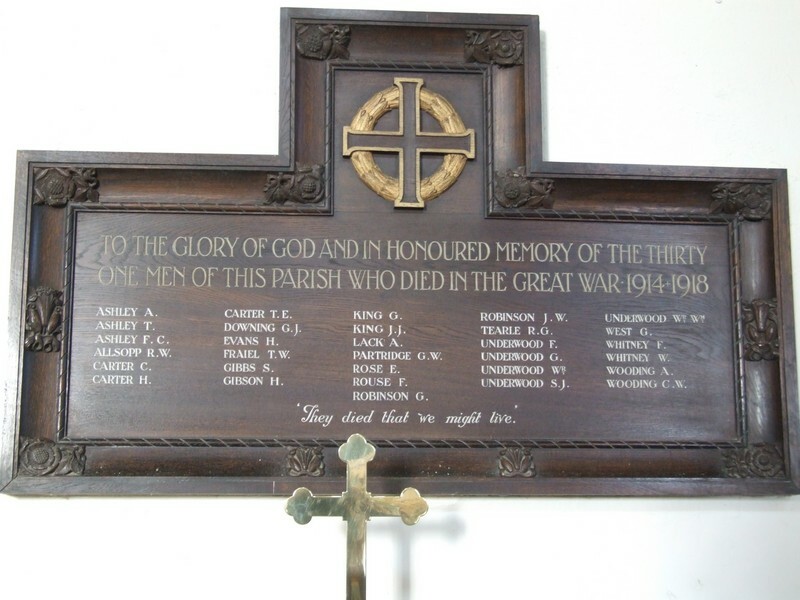 In the church of St Andrew, Yardley Hastings, there is the memorial to Rowland Grigg Tearle, and other young men who died in the Great War. St Andrews, Yardley Hastings, Northants. Private 55930, 11th Field Ambulance, Royal Army Medical Corps. Died at home 9th June 1916. Age 20. Born London, enlisted Northampton. Buried near the East boundary in ST. ANDREW CHURCHYARD, YARDLEY HASTINGS. WW1 memorial inside St Andrews Church. His details as recorded by CWGC are exactly the same as this. The army records that Susannah Rogers was paid two gratuities, as the sole person named in his will. Rowland Tearle UK Army Effects. Rowland’s (sometimes spelt Roland) WW1 army medals card recorded that he died 9/6/16 and that he had earned the British Medal, the Victory Medal and the Star. 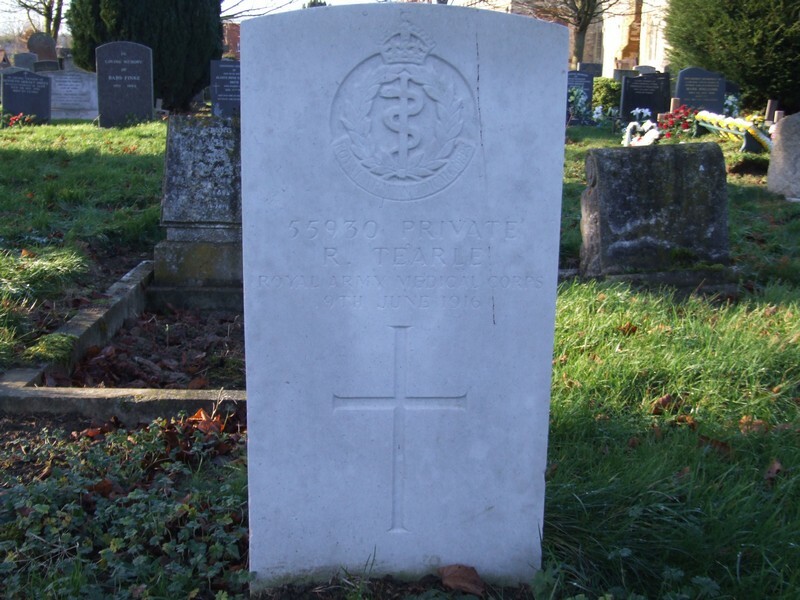 It noted that he joined the French Theatre of war on 27/5/15 and that he was in the Royal Army Medical Corps. I can find no other military record. CWGC headstone for R Tearle in St Andrews Church cemetery. Given that he died at home, we can suppose either a horrible injury or a debilitating trench disease. I wonder if the local NHS would have any knowledge of him? I am often reminded of how short his life was; I do hope there is something more we can say for him. I tried to find James A 1867 Turvey, Beds, in the 1871, but he is invisible. as well as Susannah and Stephen, now living in the Keepers House near Yardley Hastings, where Stephen was a Gamekeeper for the Yardley Chase forestry estate, not far from where Milton Keynes is now. 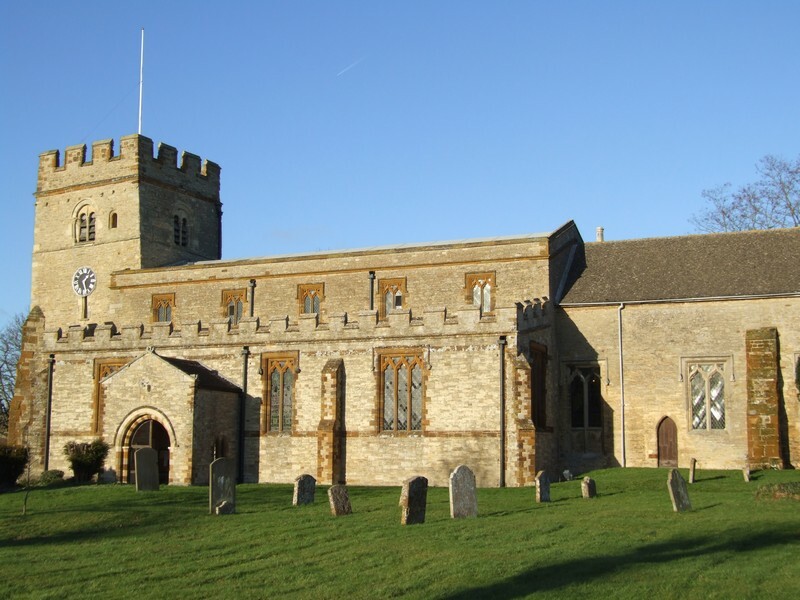 Pat Field found the Buckinghamshire Records marriage of Mary Ann Tearle 1866 and James Abraham Rogers in Q1 1886 Newport Pagnell, Northants, 3a, p695. “Date 8 Mar 1887 Entry James Abraham Rogers, full age, bachelor, Servant of Little Linford son of Stephen Rogers, Gamekeeper married Mary Ann Tearle full age spinster servant of Little Linford dau of John Tearle deceased. Witnesses James X Johnson, Alice Sheargold Banns not found Parish Little Linford St. Leonard. For Susannah, the 1901 census painted a different picture – she was now a widow, and there was a young chap – Frank Gordon, 1yr – born in Calcutta, India living with her, then Rowland, and Mary Elizabeth, her daughter. They had must have moved into the village after Stephen’s death, and Mary was earning some money for them as a dressmaker. Rosemary wrote to tell me she had seen Rowland still living with Susannah in the 1911 census in Yardley Hastings. For me, Susannah was now officially an In-Law, and has her place on The Tree. There was a definite family connection, then, between Susannah Rogers and the Tearles, specifically John 1825 and Sophia nee Walker, but this didn’t explain why Rowland was living with her, and whether there was an equal familial relationship with his mother, Elizabeth. I did the Tearle births calculation: 22 years for the boys from the birth of their first child, perhaps as few as 18 for the women. Elizabeth had to be born earlier than 1878, but probably not earlier than 1866. 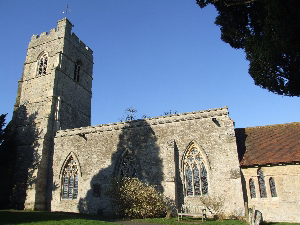 Sophia died in 1880 and was buried in All Saints, Leighton Buzzard. Rosemary reminded me of the 1881 census return, with the kind of blinding insight that only Rosemary does. In the 1881 Leighton Buzzard census there is recorded the contents of a house in Vandyke Rd. This is so important to the story that I have reproduced the essential viewing portions of both pages of the return. The head of the house is Mary 1822 LB, there is her brother John 1824 LB, Greenwich pensioner (navy) and her other brother Charles 1827 LB also a Greenwich pensioner, then Harriett 1860 LB a niece, then Alice 1862 LB a niece, then Charles H 1865 LB a nephew, Charles E 1866 from Morpeth, and Eliza 1869 and Elizabeth 1872 from Linslade. Since everyone in the house is either a brother, nephew or niece of Mary 1822, then all of them are direct descendants of John 1780 and Sarah nee Claridge. In the 1871, Mary had two of Edmund’s children, plus her own. 1871 = Mary 1822 LB Sarah 1846 LB Alice 9 Charles 6 in LB I couldn’t find Harriett 1860 anywhere. Harriett 1860, Alice 1862 and Charles 1865 all come from another of Mary’s brothers, Edmund 1833, who lived just round the corner in Hockliffe Rd, but who died in 1867 and his wife Harriett in 1869. In 1871, Edmund 1855 who would become a well-known stage manager and actor, was already in Liverpool working in an office, so he was independent. Charles Edward from Morpeth is the son of Charles 1827. That means that Eliza and Elizabeth from Linslade are John’s children. I don’t have a birth cert for Elizabeth, but this is probably her: Q3 1871, L.B. 3b 156. Until the certificate turns up and proves me wrong, I think it is acceptable that this Elizabeth 1871 is John and Sophia’s girl. The only other family having children in Linslade were John’s brother Thomas 1821 and Sarah Jane nee Elliott. Their last child was George 1862 and adding Elizabeth 1871 is not impossible (Sarah would have been 47) but unlikely. Sophia nee Walker, John’s wife, died in 1880, so this was simply a late baptism for Elizabeth. It certainly helps to show that he had a daughter Elizabeth and one supposes this is not Eliza. “Susannah’s daughter-in-law was Mary Ann Tearle, born Linslade in 1866. Mary Ann’s parents were John (1825) and Sophia, nee Walker. Her siblings were Sarah Jane (1863), John (1864), Eliza Sophia (1868) and Elizabeth (1871). 1891 = Elizabeth 1872 Linslade, barmaid, in Rugby but she was not in any 1901 census. As to who was Rowland’s father – Rowland Grigg is an unusual Christian name and I pondered as to whether this could have been the name of his father. I tried to see if there was a famous Rowland Grigg about when Rowland was born, but could find nothing on Google. So looked to see if a Rowland Grigg did indeed live in England. There is a Rowland Grigg who was born, lived and died in Yarmouth, Isle of Wight – 1872 – 1901. This seemed to be too far away from where Elizabeth lived and worked. But then I found that Mary Ann’s two children were born in Ashurst Wood Sussex, not all that far from the Isle of Wight. Could Elizabeth been staying with her sister Mary Ann? Could Elizabeth and Rowland Grigg and have met? Brighton, that most famous of holidaying sites, was near to both Mary Ann’s and Rowland’s residential areas. The Isle of Wight itself was also a well-known holiday destination popularised by Queen Victoria. Rowland Grigg of the Isle of Wight was the son of a draper and had no occupation recorded in the census before he died. His, too, was a short life. So I think we have finally told the bare bones of Rowland’s remarkable story. He is a member of a proud and illustrious family – the theatrical Tearles. We have established that his mother was Elizabeth 1871, the daughter of John 1825, the marine, and Sophia nee Walker. I am sure there is still a story to be told about why she was in Rugby in 1891 and why she was working in Willesden about the time of Rowland’s birth. His family’s times were difficult, and children were brought up by the extended family rather than by their parents. All the evidence shows, though, that they were still well brought up. Rowland heeded the call to war, and signed up to save lives rather than to take them. This decision cost him his own life, and we can only speculate on the misery it may have caused him as he lay dying in Susannah’s house. We have established his family connections, and we have acknowledged the debt we owe to Susannah Rogers and the generosity she showed him. There is one other memorial we discovered; on the wall of the Yardley Hastings Memorial Hall that faces the road is a memorial to the young men who died in WW1 and WW2: Rowland is with them. He has been called Greg, but we are aware of exactly who he was. 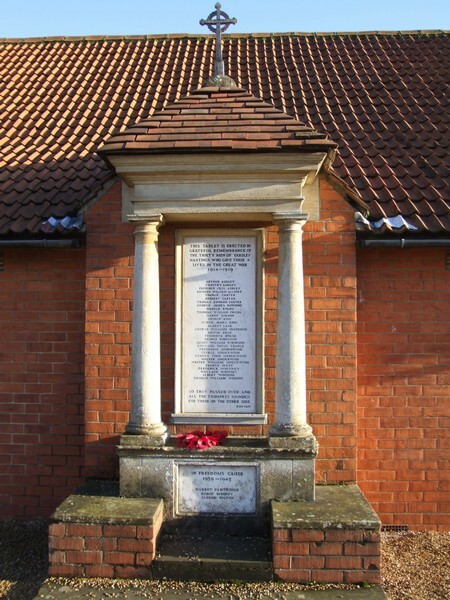 War Memorial on hall, Yardley Hastings. 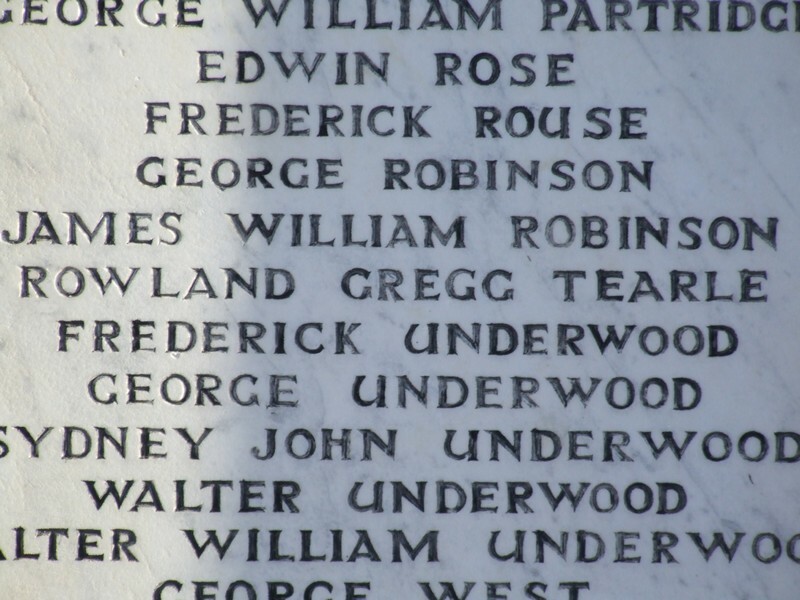 Close-up of names on the War Memorial Hall.